As the market continues to only go up or sideways (down is unfashionable), the NASDAQ is making a run for October 2007 highs of 2817. 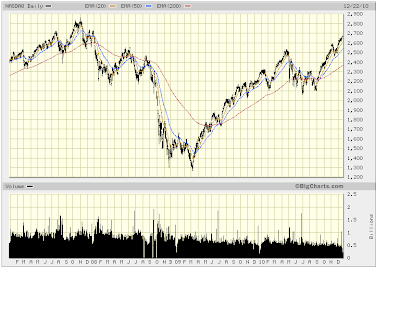 As I type, the index is about 5.5% away... at current pace we would be there by the 2nd week of January 2011 or so. 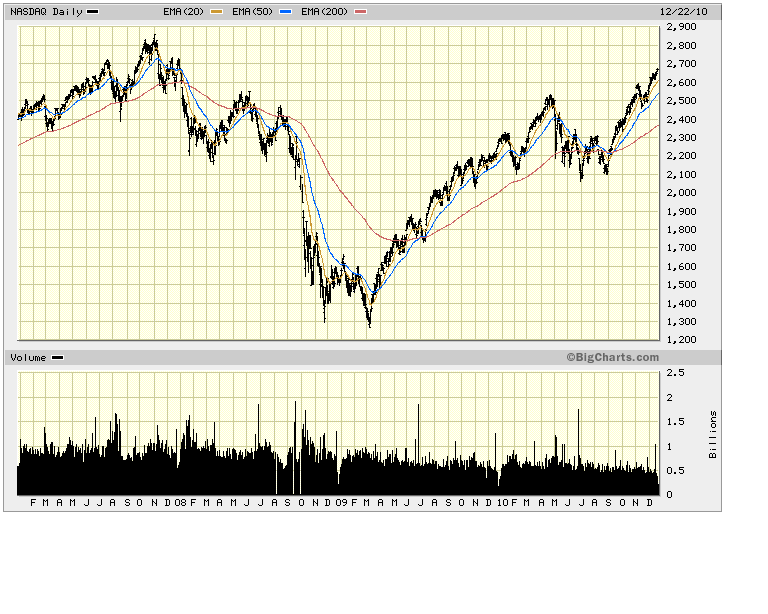 Of course we are still a tad bit off all time highs in the NASDAQ....ahem. We now appear to be operating under the Alan Greenspan model of 1999 (although we replaced the phantom enemy of Y2K with deflation), although with the debt overhang in the real economy Ben is probably going to have to go to QE4 or QE5 to match the incredible 'prosperity' that Alan gave us in 99 and early 00, at least on the NASDAQ. He is going to have a much easier time banging the S&P 500 higher since the speculator class of the last decade was busy bidding up Pets.com rather than Caterpillar. 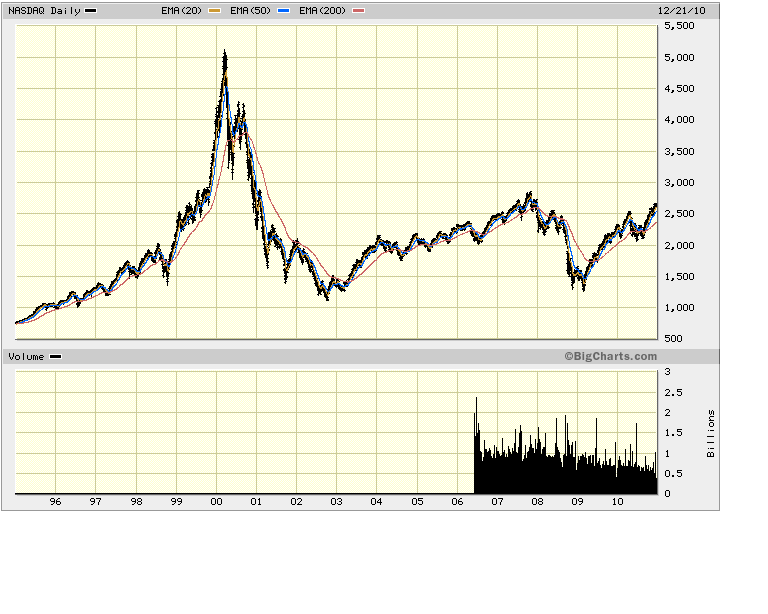 At current pace, the index should be able to surpass all time highs by mid 2011 as we rally 5-7% every month. (ok ok bears, we'll give you one month of -5% somewhere in first half 2011 just so you won't go home crying) That will be just about the time QE2 ends and the cries from the speculator class for QE3 begin. ("I don't care if oil is $125, GDP is 4% and S&P is 1800, just give me more steroids!") Actually it is going to be pretty bemusing to see markets at all time highs with unemployment over 9% - talk about the two worlds of Wall Street and Main Street. 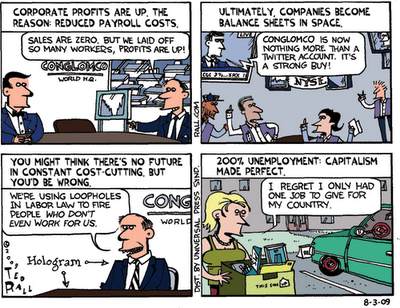 But indeed this is the corporate nirvana we have worked towards, and we're achieving it. 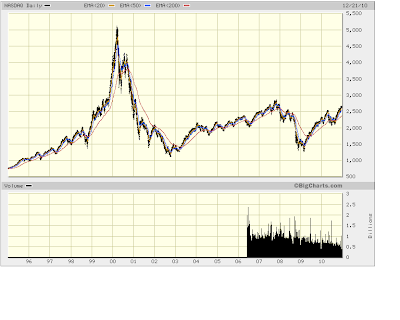 edit: NASDAQ in gold terms - not so impressive last 3 years. Thankfully everything is priced in dollars so we can be giddy about losing the value of the dollar while making it up in stock prices. We're actually lower than summer 2009 priced in a non fiat currency.